Last week a Florida nonprofit, the Aerospace Research and Engineering Systems (ARES) Institute, announced a competition titled “Win A Trip To Space!”. The idea was simple: buy a raffle ticket, and one lucky winner will get a ticket on a suborbital spaceflight. But the contest rules appear to have quietly changed since last week’s announcement, perhaps to ensure that they comply with state law. Both the explicit charge for the tickets and the requirement that a certain number be sold, though, appeared to run afoul of Florida law. Section 849.0935 of the Florida Statues does allow nonprofits like the ARES Institute to carry out “drawings by chance” like this one, but with several conditions. One of them is that it is unlawful to “require an entry fee, donation, substantial consideration, payment, proof of purchase, or contribution as a condition of entering the drawing or of being selected to win a prize.” (It does go on to state that organizations are allowed to suggest a minimum donation.) It’s also unlawful to “condition the drawing on a minimum number of tickets having been disbursed to contributors or on a minimum amount of contributions having been received”. 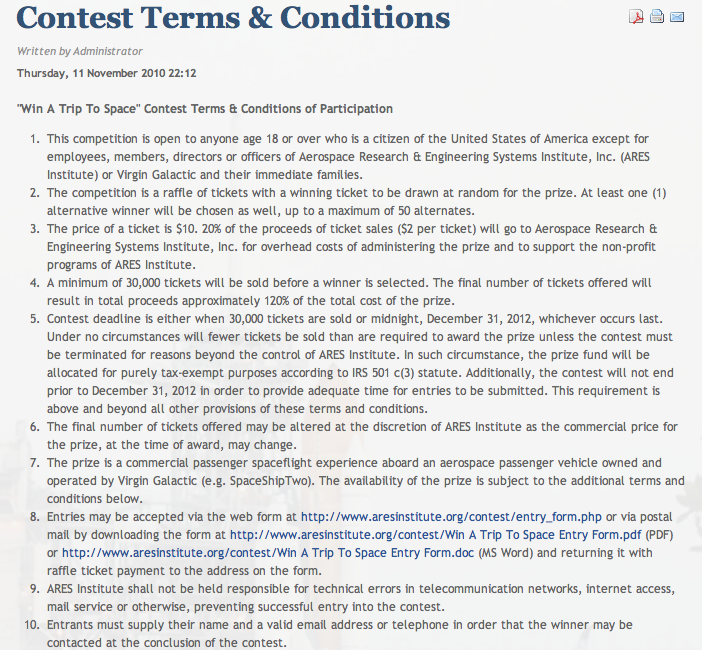 A screenshot of the original competition rules, as they appeared on the ARES Institute's web site on November 13. There’s one other change in the new rules worth noting. The current rules mention only that the winner will get “a commercial passenger spaceflight experience on a passenger aerospace vehicle supplied by commercial provider”, generically referred to in the rules as a “Spaceflight Provider”. The older version of the rules, though, specifically mentioned Virgin Galactic as the spaceflight provider (“a commercial passenger spaceflight experience aboard an aerospace passenger vehicle owned and operated by Virgin Galactic (e.g. SpaceShipTwo).”) Other elements of the original rules prohibited Virgin Galactic employees and their families from participating, and also noted that “Virgin Galactic is the sole operator of the spaceflight and has sole discretion over legal and contractual obligations between Virgin Galactic and the prize winning participant.” While those rules also noted that the ARES Institute is not affiliated with Virgin, it appears that either the organization is hedging its bets about availability of suborbital spaceflight operators or was asked not to explicitly identify Virgin in the rules. For the past 10 years I have worked very hard to bring forth a LEGAL solution so the everyday person may have a legal solution to participate in space tourism. When the ARES Institute announced their raffle, I felt I should quickly advise Matthew Travis he was in direct violation of law. He replied back and said he was going to remove the raffle. Seems to me he desires to learn the hard way. It would not be suprised to see not only an Attorney General (in another state) indict him for violation of internet gambling but for Homeland Security to also enforce The Patriot Act. If the space tourism raffle was the solution I would have done it years ago!